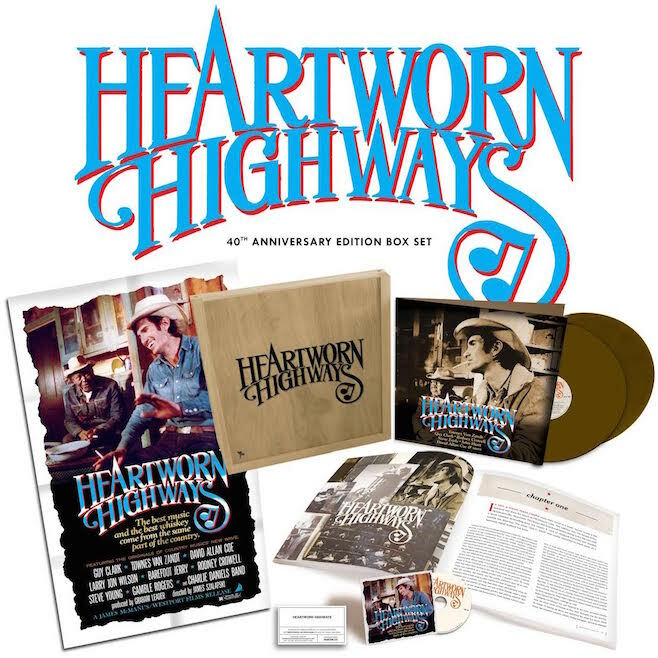 As posted on Pitchgork.com the classic and celebrated roots music documentary Heartworn Highways is getting the Record Store Day (April 16th) deluxe treatment. The 1976 documentary by James Szalapski chronicles the rise of late 70’s roots and country music. Filming for the doc takes place in in Texas and Tennessee in the last weeks of 1975 and the first weeks of 1976. It features intimate and ofter astounding performances by Townes Van Zandt, Rodney Crowel, Steve Earle, Guy Clark, Steve Young, David Allan Coe, Larry Jon Wilson, and others. Over the years, the film and soundtrack have been lauded by fans and musicians and has achieved cult status. On Record Store Day (April 16), Light in the Attic will release a limited (1,000 copies!) 40th anniversary 1,000 copies set featuring the film, its soundtrack, and more seen below. – DVD of original 1976 film with restored image and sound. This is the first time the film has been restored to its correct speed in a DVD format. – DVD includes 45 minutes of bonus features, including performances by Townes Van Zandt, Guy Clark and others. Record Store Day was founded in founded in 2007 as a way to help struggling independent music retailers. The annual event has done much to fuel the current vinyl boom by offering unique and limited run editions like this one. Find trailers for the film and the box set below.